Welcome, Friends! It's Kelly Martin and I'm thrilled to be guesting here on Catherine's blog today. Couldn't be more humbled and thrilled to be here and share my card using some products from the newest Zen Garden Release! So I was happy to oblige. If you'd like to create a card like this one, then all you'll have to do is cover the background stamp in versamark ink and stamp it on to CP Premium White cardstock. Then you'll want to cover the panel in white embossing powder and heat set it. After the panel is set, take your ink blending tool and your favorite Catherine Pooler ink (I chose Party Dress) and blend away! I wanted to create an ombre look, so I applied heavy ink at the top and then faded into white toward the bottom. You'll want to trim down the sides of your panel and then glue it on to your cut and scored 4.25 x 5.5 inch card base. 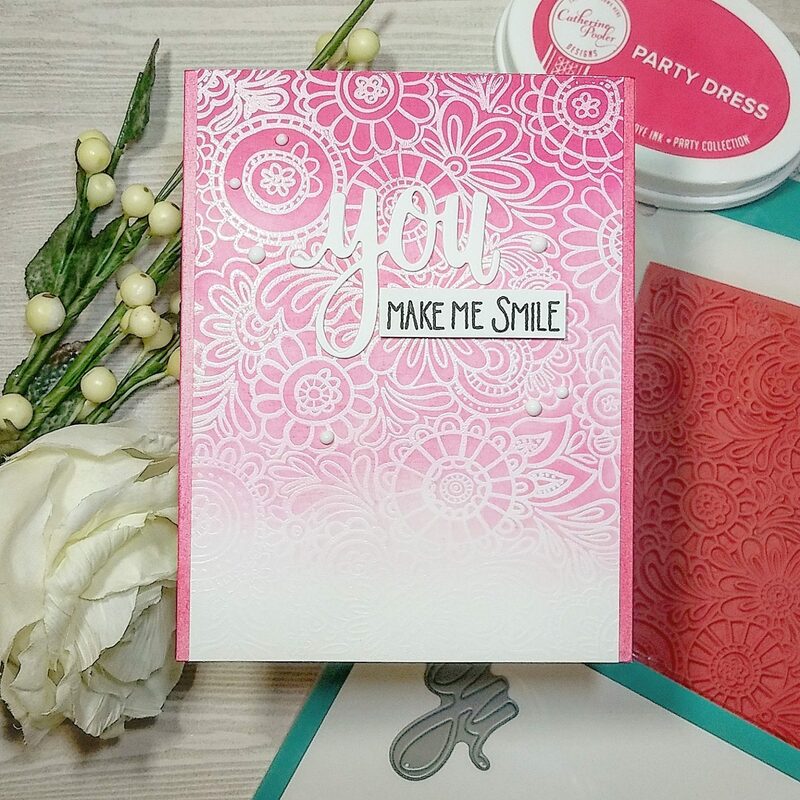 I chose the “You” die from the release and cut several pieces of the same white cardstock and layered them up before gluing the stacked die cut sentiment on to the card. 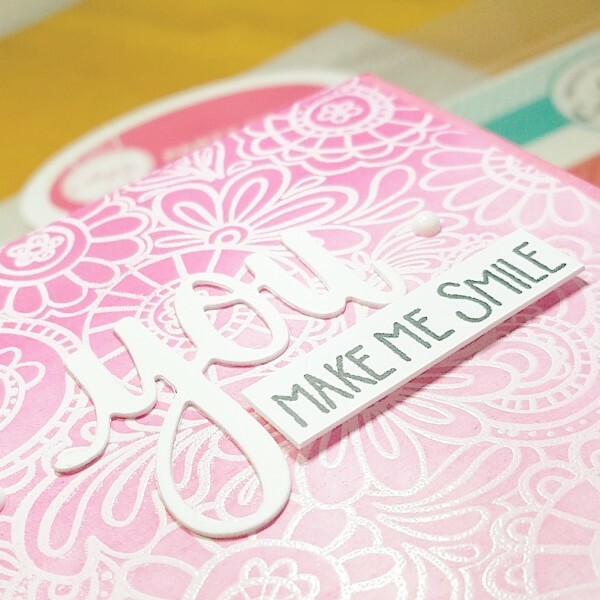 I then stamped the “make me smile” sentiment from the Love Grows stamp set on to a small sentiment strip and glued it on to the card to finish it off! The beauty about this type of card is you can choose any of your CPD inks or word dies to create a fantastic card! 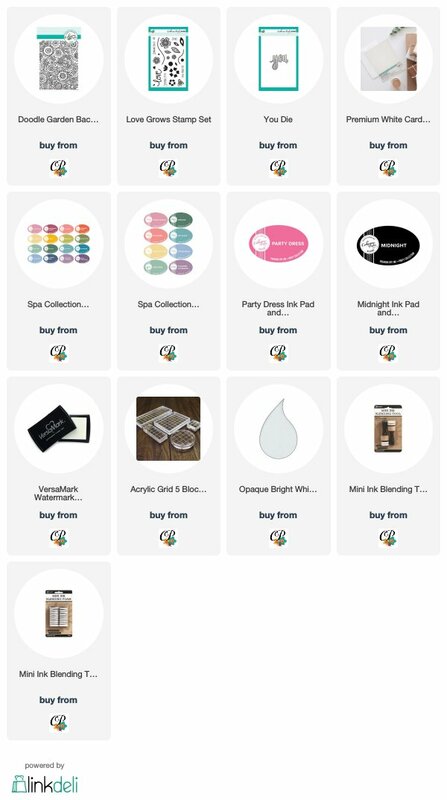 Thanks again for stopping by, and have a crafty day!